Each elytron of imbricatum has 16 intervals, it is to say that only one tertiary interval exists on each sides of a secondary one ("triploïde" type of Jeannel). 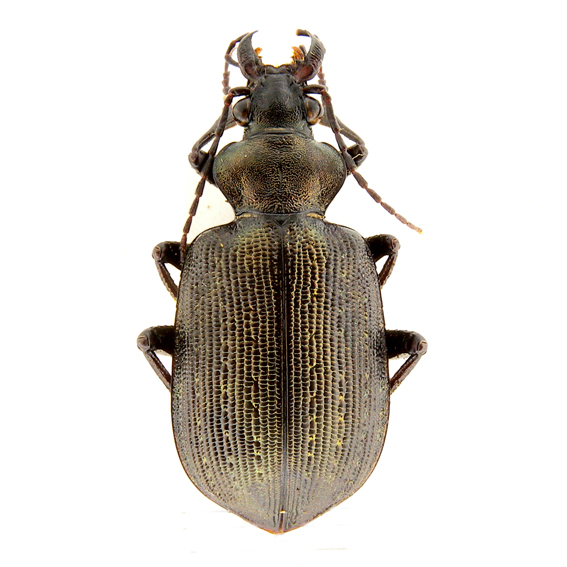 imbricatum is the only species of Caminara that has this model of sculture of the elytra. Does exist in South West Africa a population (hottentotum) that seems to be isolated and that is well characterized by its slimmer body shape and unique colour, but in the remaining area in which it is diffused, imbricatum presents a very scarce differentiation, concerning some variation in size and body shape, or the greater or lesser visibility of the sculpture of the elytra. However, in the north east of the distribution area (Central Asia) we find a population (deserticola) that has a larger and more elongated body with less raised elytral sculpture. 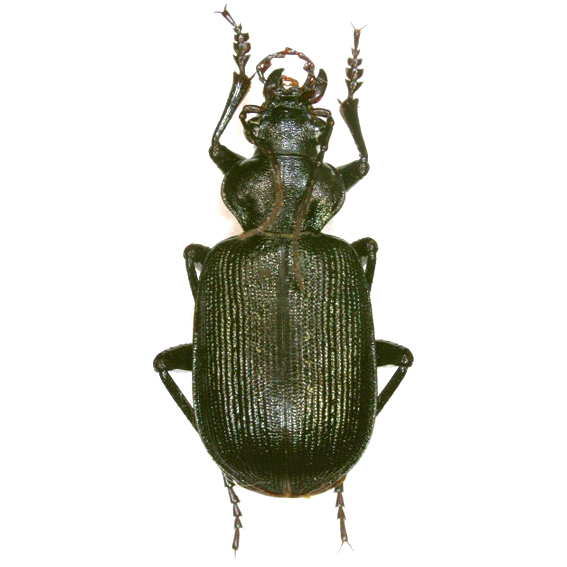 Jeannel (1940) considered deserticola as a separated species, that he even included in a different genus (Campalita), and recognized for imbricatum a limited number of subspecies. Later Mandl (1970: 62), considered deserticola as a mere subspecies of imbricatum, having described (1953, 1967, 1970) some more populations of the latter. In our opinion, except hottentotum and deserticola, the remaining populations of imbricatum, that are widespread from Cabo Verde archipelago through the Sahelian zone to Arabia, Iraq, Iran, Pakistan, do not present significant differences except for a slight variation in size. 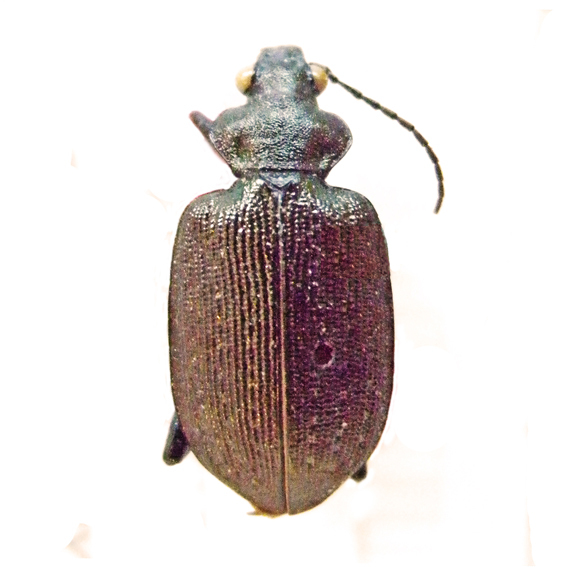 However, from further south (Central Indian Peninsula), has been described another population, also of relatively large size, but stouter and with a still more flattened sculpture of elytra (andrewesi), that possibly also could be maintained at subspecies level. Length 15-22 mm. What we consider as the typical populations are the ones with individuals of small or medium size having finely punctate head and pronotum, elytra in oval widened, and elytral sculpture with scaly intervals. The upper body is black, with faint bluish reflexes. C. imbricatum imbricatum continuously spreads in Africa, excluding the area of equatorial forest, from the Canary and Cabo Verte islands, throughout the Sahelian zone, Algeria, Libia, Senegal, Mali, Niger, Chad, to Sudan, Eritrea, Djibuti, Ethiopia, Somalia, Kenya. Here and there in East Africa it is possible to find single specimens with slightly more wrinkled head and a little stronger elytral sculpture. On this basis Mandl (1968c: 128) described from Somalia the subspecies linnavuorii that he considered intermediate between the typical one and ottenttotum and that would be present throughout the Horn of Africa from Somalia to Kenya. However, the inconsistency of the characters does not seem to justify this subspecies. In Kenya, the situation is more complicate. In north-eastern Kenya, we find some populations definitely referable to C imbricatum imbricatum and Breuning (1927: 221) reports the nominate subspecies from south west (Taveta, very close to the Tanzanian border). Jeannel (1940: 105) cites C. imbricatum hottentotum from the locality of Sultan Hamud in Makueni Province and Mandl (1970: 61) attributed this citation to his C. imbricatum linnavuorii. Still from South West Kenya (Amboseli park, mid-way between Sultan Hamud and Taveta), we have seen specimens with more pronounced characteristics of sculpture and color, to the point that could be considered transitional towards C. imbricatum hottentotum. These specimens have bronze lustre of the upper side of the body and rougher elytral sculpture than C imbricatum imbricatum, though, if compared with C. imbricatum hottentotum, they have a stouter shape, a darker colour of the upper body and, slightly less deeply punctate, head and pronotum . 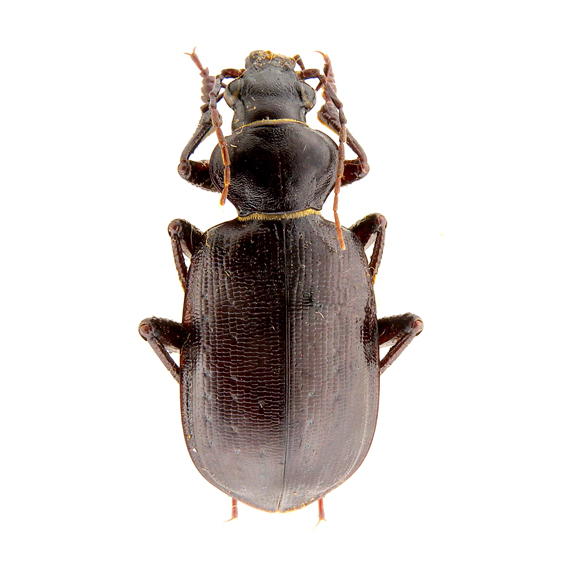 One might conclude with Jeannel (1940: 105) that C. imbricatum hottentotum is present in Kenya (Bruschi, 2013: 76), or consider these specimens as simple individual variations within C imbricatum imbricatum. However, before to definitevely decide if these specimens are part of an omogeneous population and eventually which relationships there are between this population and C. imbricatum hottentotum, remain to explain the citation of Breuning of the typical form from this same region and the strange fact that no captures of specimens of C imbricatum have been published up to now in the vast area between Kenya and South Africa. Going to East, the roughness of the head and pronotum decreases and the elytral sculpture tends to flatten. 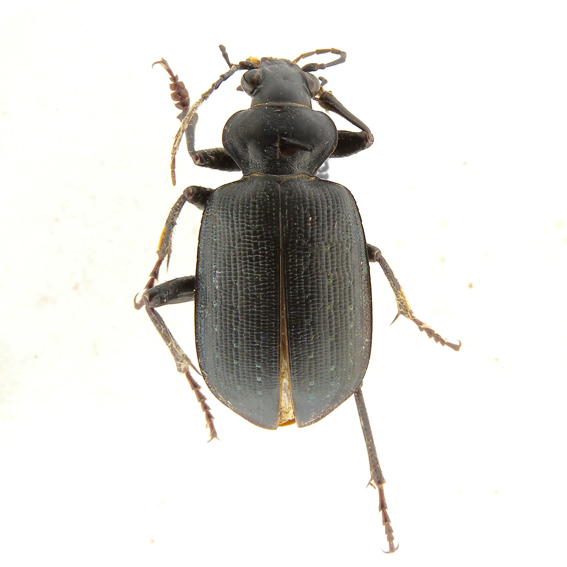 We find populations variously named, but that can also be referred to the typical form and that live in the Arabic peninsula: Yemen, Kuwait, Saudi Arabia, Oman, Qatar and Iraq (which all Mandl considers as C. imbricatum arabicum), southern Iran (C. imbricatum loeffleri), up to south western Pakistan. The populations of central and northern Pakistan someway accentuate these characteristic and look as transitional to C. imbricatum deserticola. Algeria. Temassinin (Fort Flatters); Tassili n'Ajjer (Mountains Domergue) (Jeannel, 1940: 105). Cabo Verde (Republic of). Ilha de Boa Vista (SB); Ilha Brava (Wollaston, 1867: 6); Ilha do Fogo: (Breuning, 1927: 221), São Filipe (Herbert, 1987: 97); Ilha do Maio (Oromí & al., 2005: 79); Ilha do Sal: (RMCA), Espargo (Herbert, 1987: 97); Ilha de Santo Antão (Breuning, 1927: 221); Ilha de São Nicolau (RMCA); Ilha de Santiago: (Wollaston, 1867: 6), Praia (Herbert, 1987: 97); Ilha de São Vicente: (Wollaston, 1867: 6), São Pedro (Herbert, 1987: 97). Canaries Islands (Spain). Tenerife (Andrewes, 1929: 64). Djibuti. Djibuti (EM, SB); Ambouli (DP, EM, SB); Obock (RMCA, SB), bay of Tadjoura (Mandl, 1968: 130). Egypt. Alexandria (Breuning, 1927: 222); Gulf of Solum, El Hamam, Assuan, Wadi Halfa, Gebel Elba (Schatzmayr, 1936: 24), Marsa Halaib, Wadi Haideb, Abu Simbel, Sallum, Maryut lake (Alfieri, 1976: 3). Eritrea. Wachiro (AC); Massaua (SB). Ethiopia. Gamo Gofa: Kelam (AVT); Oromia: Langano Lake (SB); 40 km W Konza (SB). India. Thar Desert (Mandl, 1970: 63). Iran. Fars (Mandl, 1970: 63); Lorestan: Firouz Abad (Mandl, 1970: 63); Hormozgan: Abad Geno, 40 km nord Bander Abbas (EM), Posht-Koh Village, Minab road (Azadbakhsh & al., 2015b: 226), Hasan-Langi (Azadbakhsh & al. 2015c: 45); Kerman: Rigmati, (paratype of loffleri) (NMB); Sistan and Baluchistan: Bampour, Khasch, Iranshahr, Irafshan (Mandl, 1970: 63); Tehran: 70km SW Tehran, Yusefabad (Mandl: 1967; 458). Iraq. Basrah (Andrewes, 1929: 64), Ramadi (Mandl: 1967; 458). Kenya. North Eastern Province: El Wak (SB); Eastern Province: Laisamis (SB); Marsabit to South Orr (Häckel et al, 2016: 15); Taveta (Breuning, 1927: 221); Rift Valley Province, Amboseli Nat park (SB; sub hottentotum Häckel et al, 2016: 15); Makueni Province: Sultan Hamid (sub hottentotum, Jeannel, 1940: 105). Kuwait. Sha`ab, Erifjan, Sobiya (sub deserticola Al-Houty, 2004: 62). Lybia. Fazzan, suburb of Ghat (JCR). Mali. Timbuctu (Jeannel, 1940: 105). Saudi Arabia. Rub al Khati (AMNH); Jidda (Jeddah) (RMCA); Hejaz (Andrewes, 1929: 64); Riyadh (Wittmer & al., 1979: 527); 100 km NE Riyadh, Rawdhat Khorim NP 550m (Abdel-Dayem & al., 2017; SB); Al-Baha prov: El-Hawya, Wadi Turabet Zahran (El-Hawagry & al, 2013). Notes: Winged, attracted to light at night. Taking into account the wide distribution area, almost entirely included in the equatorial, tropical and sub-tropical zones, the period of activity covers the whole year but varies locally influenced by the precipitation regimes. Somalia, N. Hargheissa,23-28.VI.63. 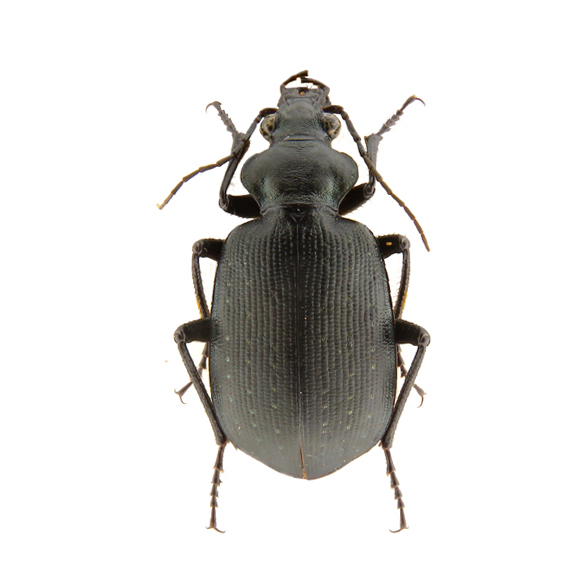 paratype of Calosoma (Caminara) imbricatum linnavuorii Mandl, 1968. Kenya: Amboseli Nat. Park, 25.Jan.2001,Nádai Lázló lg. Length 18-20 mm. 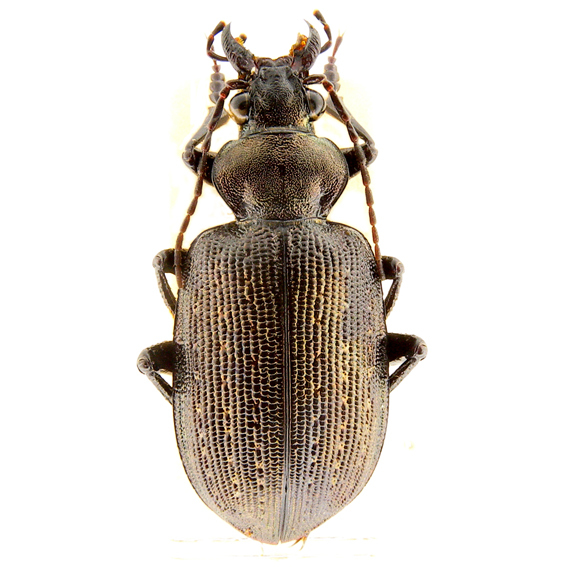 This population is distinguished from the others because of head and pronotum with large punctures and with deep, transverse, wrinkles and because of the rougher sculpture of the elytra. Moreover, C imbricatum hottentotum in all cases has the upper part with weak bronze reflexes (not bluish as in the other populations). C imbricatum hottentotum is well known from, and possibly restricted to, Namibia and South Africa. Coming back to the idea already expressed by Jeannel (1940: 105) and initially shared by Bruschi (2013: 76), Hackel & al. (2016) consider the specimens from South West Kenya (Amboseli park) as C. imbricatum hottentotum, to which they add doubtfully the type of C. aetiops from Niger, that they regard as a synonym for C. imbricatum hottentotum. Thereby the distribution area of this subspecies would be greatly increased and constituted by an array of widely separated populations. Namibia. Mariental 1120 m (SB); Okahandja Gross Barmen (EM); Omaruru Uis (EM, SB); Klein Karas (RMCA); Hardap reg., Maltahohe 1350m. (SB); Erongo prov., Usakos 900m. (SB); Otjitambi (Mandl, 1970: 62); Otjozondjupa reg. Otjivarongo; between Gobabis and Aranos (Häckel et al, 2016: 15); Walvis Bay, Great Karas Mts., Kaross, Rehoboth, Kunene reg. (IZICO, gbif.org). South Africa. Cap de Bonne Espérance (lectotype) (MNHN); Western Cape: Upington (RMCA), Pniel (Jeannel, 1940: 105); Northern Cape: Kimberley (Breuning, 1927: 223), SW Kimberley, 13 km SW Ritchie (Häckel et al, 2016: 15); Augrabies National Park, Orange river (http://assazhnev.narod.ru/carab_atlas.html). 3-4.III.97, Audisio, Bologna, Zapparoli lg. Length 22-28 mm. Described by Semenov (1897) as a species and maintained as such by Breuning (1927) and Jeannel (1940), it has been considered by Lapouge (1932) and later by Mandl (1969) as a mere subspecies of C. imbricatum. 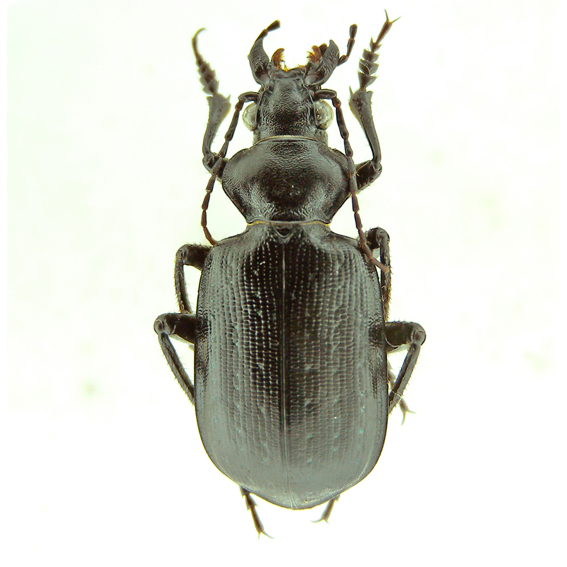 In fact C. imbricatum deserticola is quite similar to the typical C. imbricatum imbricatum and only can be distinguished because of the constantly larger body size, the more flat sculpture of the elytra and by the black colour without bluish or bronze reflections. 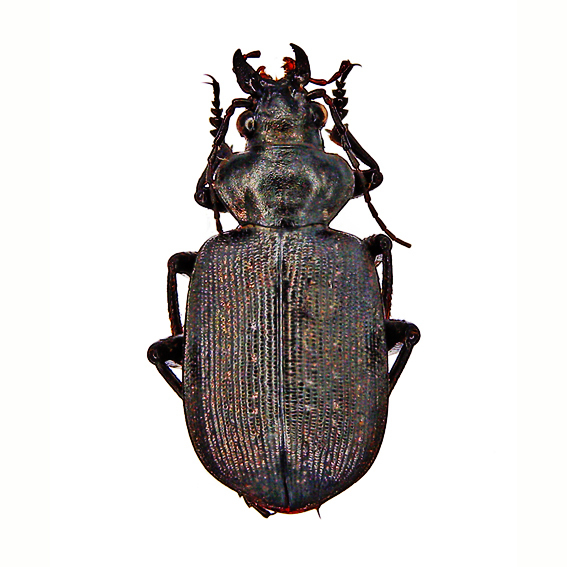 The populations of Central Asia mostly have larger body and less expanded elytra, but going east (Mongolia) the individuals became smaller and stouter, although maintaining the same model of elytral sculpture. Obidov (2005: 5) considered the Mongolian population as a distinc taxon (C. deserticola augustasi). The feebles differences that he used in his diagnosys, apart from the lesser size, do not deserve to be taken into consideration in a such variable species as the complex of C. imbricatum is. 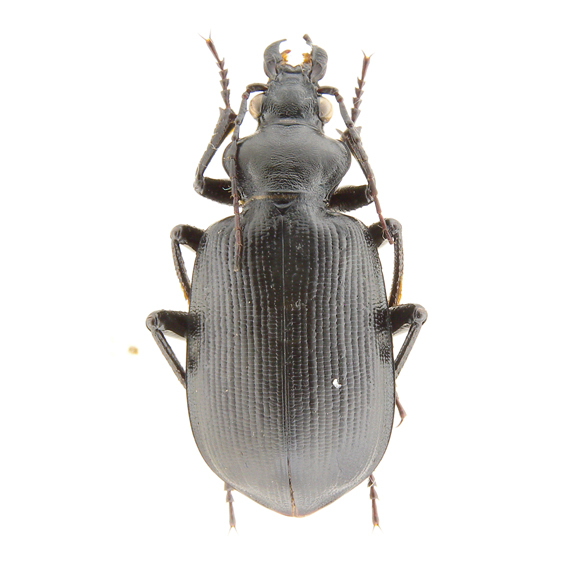 Thus we can simply conclude that C. imbricatum deserticola in Mongolia is represented by an isolated, but very little differentiated, population. As for the populations of central and northern Pakistan, it is possible that these represent a transition between C. imbricatum deserticola and the typical form. Length 20-22 mm. 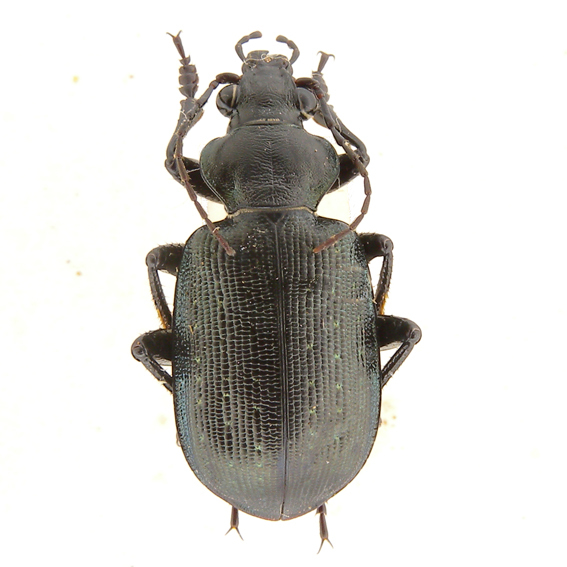 Chaudoir (1869: 368) first described a specimens of a Calosoma coming from India and tentatively identified it as the Calosoma orientale previously named by Hope. 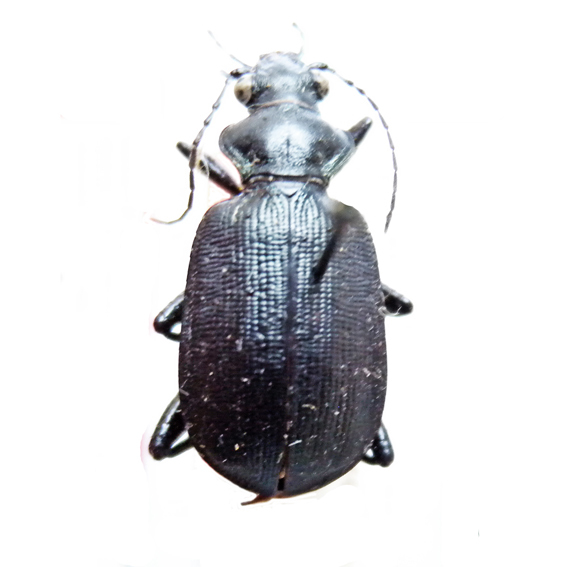 Later Breuning (1927: 222), once ascertained the presence of a population of C. imbricatum in India, kept the name Calosoma imbricatum orientale for it and so endorsed the misunderstanding of Chaudoir. Only more later Breuning (1928: 95), when correctly identified C. orientale with the species until then called C. squamigerum, renamed the new subspecies C. imbricatum andrewesi. 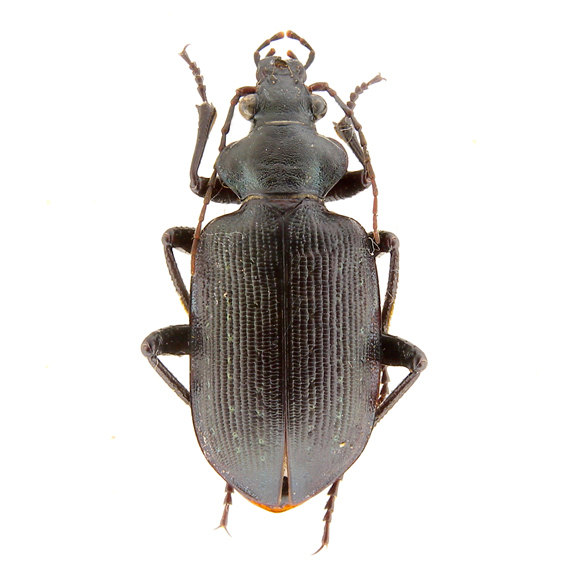 C. imbricatum andrewesi consists of populations of a relatively large size, with a stout body and flattened elytral sculpture. 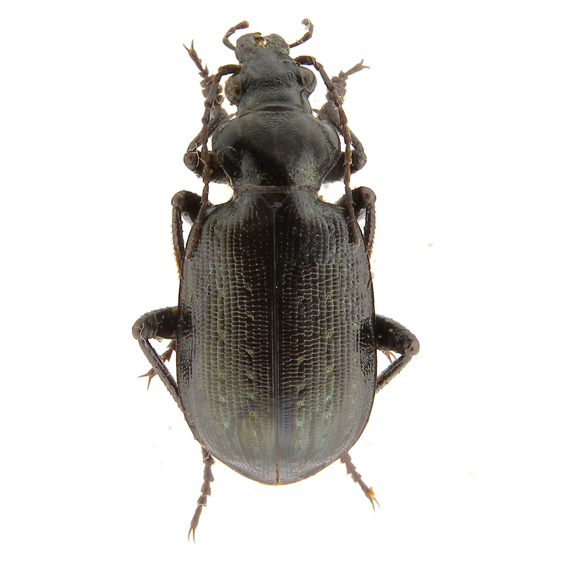 The colour of the upper body is a dull, not metallic, black. It has been found in few localities of northern India (Rajasthan, Bengal, Assam), where it seems quite rare. 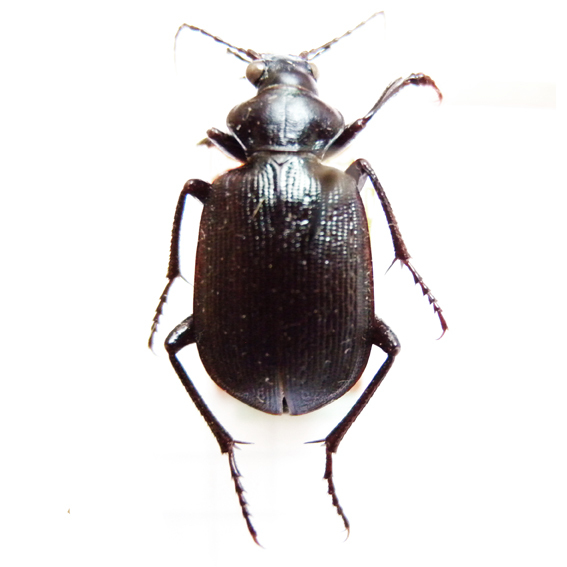 Notes: The subspecies has been named after Herbert Edward Andrewes (1863 - 1950) an English entomologist, specialist in Carabidae, that worked at the Indian Forest Service and later at the Natural History Museum in London. As the other populations of the same species, C. imbricatum andrewesi is winged and attracted to light at night. Active individuals were captured in July. India: Rajasthan, Jaipur, VII 1988, Pad. Mal. leg.